I’m excited to spend a few weeks prospecting (projects, not fool’s gold) in the PNW starting April 15th. In addition to a residency at the HJ Andrews Experimental Forest, I’ll be giving a variety of public talks and workshops. Reach out and say “hello” in person. I’m looking forward to speaking at Reed Hilderbrand Landscape Architects on Wednesday, March 13th at 6:30PM. I’ll be presenting my Hybrid Vigor talk. This particular presentation will be geared towards landscape architects/designers and others interested in using a combination of art, design, and ecology as a public engagement tool for landscape stewardship and ecology-minded decision making. Event is free and open to the public. Please RSVP here. I’ll be a writer-in-residence at the HJ Andrews Experimental Forest this April as part of the Long Term Ecological Research Site Reflections program at the Spring Creek Project. Beyond working on an artist book for fall publication I’ll be exploring opportunities for project work in the greater Portland area. 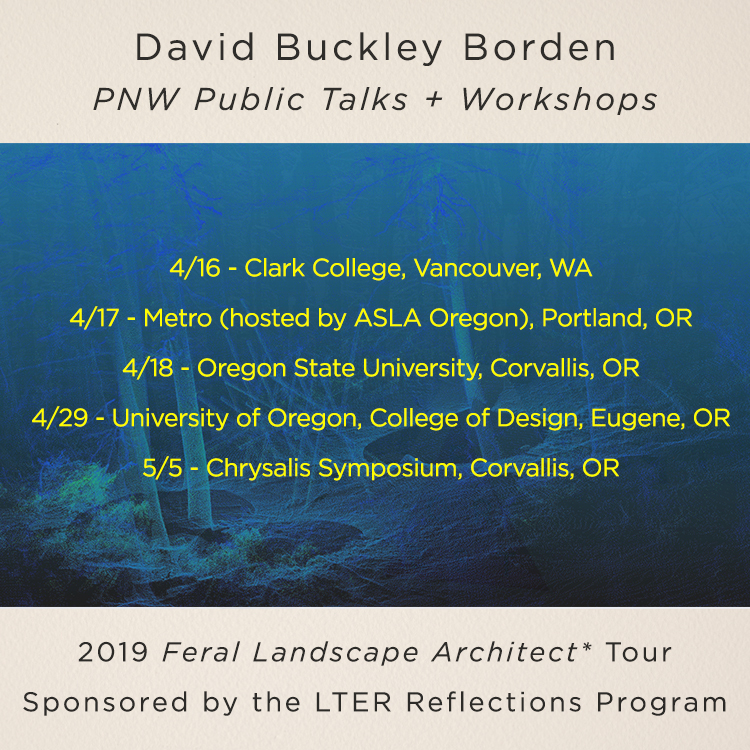 As part of my program I’ll be giving a series of public talks and workshops in Portland, Eugene, and Corvallis. If interested in hosting a talk, you can find booking details including talk abstracts here. As several ambitious projects come to a close this fall, I look forward to new opportunities in 2019. I’m excited to report that I will be participating in Now + There’s Public Art Accelerator program. This incubator-type program provides six local artists with training, mentorship, and funding to create a community-driven public art project in the city of Boston this summer/fall. I have yet to line up a community partner or site, but am open to ideas. So, please reach out. I’ll continue to work with Dr. Aaron Ellison at the Harvard Forest to produce a publication about our collaborative art-based science communication projects. The book with be project archive, design case study, and critical essay on our arts-science collaborations including Hemlock Hospice and Warming Warning. One can read a sample of our co-authored writings in the October issue of SciArt Magazine and a SocArXiv preprint for our chapter in the upcoming Routledge Handbook of Art, Science, and Technology Studies. My public speaking engagements and workshops continue to play an ever expanding role in my practice. This year included over 30 public talks/tours starting with my Hybrid Vigor presentation at the New Directions in American Landscapes conference in Philadelphia. The year concluded with a talk for educators with Dr. Aaron Ellison, entitled Environmental Art: Reflection, Provocation, and Action at Harvard Graduate School of Education’s Project Zero. In response to requests, I’ve developed three new talks for 2019 including a professional development talk for students and recent graduates which uses my career track as an example of creating an intentional self-directed interdisciplinary practice. The talk is not a stereotypical “how-to” career advice presentation, but an empowering, yet cautionary, conversation about creative growth and self-determination. Interested in hosting a talk or workshop at your organization? Click here for lecture abstracts and availability. A Big, Red, and Shiny thank you to Karolina Hac and Leah Triplett Harrington. 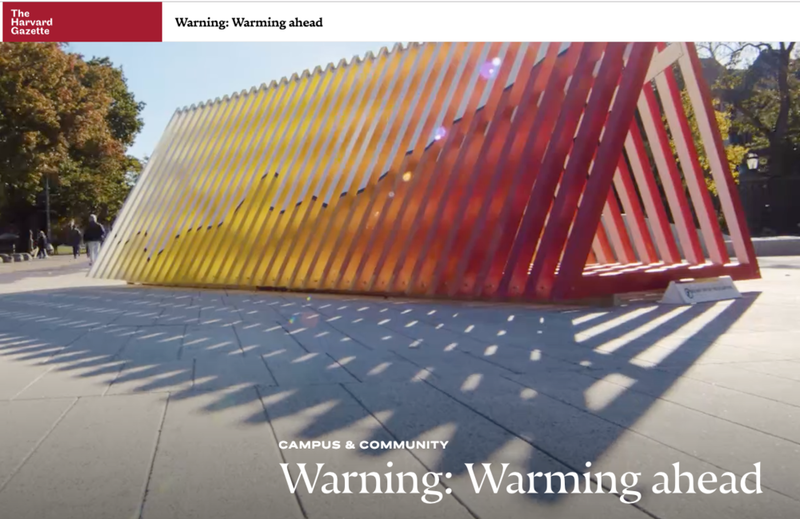 I appreciate Karolina's thoughtful interview about the recent Warming Warning installation. Read about the project origins, goals, benefits, audience response, and more on Big Red & Shiny. New artwork, and recent work from Triple Decker Ecology and Harvard Forest projects, has been added to the Mercantile section of website. New work for sale includes Wetland Command Flag (silkscreened canvas, brass grommets, and thread. 18 x 24 inches, 2018. Edition of 13), a collaboration with Helen Popinchalk of Trifecta Editions. I’m honored to participate in Now + There’s 2019 Public Art Accelerator program. I can hardly wait to get started. “Can we change the way Boston creates public art? Over the last year, we've been trying to do just that. With 2018's pilot program, the Public Art Accelerator, Now + There partnered with six Boston-based artists and communities from East Boston to Roxbury. Artists and communities worked collaboratively to present engaging, interactive, and temporary artworks. As they developed projects particular to neighborhoods around Boston, Now + There provided curatorial, technical, and financial support. We learned, we laughed, and together, we made art and shared experiences. We’re excited to continue learning, growing, and supporting Boston’s artists and communities and humbled to announce the second year of Now + There’s Public Art Accelerator, generously funded by Joyce Linde. In 2018, Linde quietly fostered our own growth by supporting our pilot year of the Accelerator. We’re deeply grateful for her commitment to Boston artists and communities. 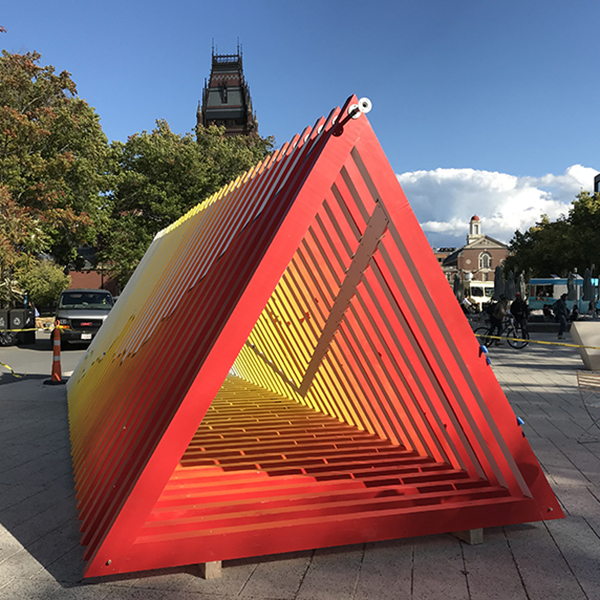 We can't wait to start working with David Buckley Borden, Pat Falco, Samantha Fields, Dell Hamilton, Cat Mazza, and Daniela Rivera to continue changing the way Boston creates--and lives with--public art. These artists are working through a variety of issues that affect Boston and beyond, from climate change to affordable housing and social equality. Like their predecessors, the 2019 cohort will receive hands-on coaching from concept to (permitted!) completion. These artists represent many different backgrounds and sensibilities and work in a range of media. Each is deeply dedicated to Boston and its neighborhoods, and is committed to sharing their work with the people across our city. Join Aaron Ellison and I at these upcoming events focused on Warming Warming and climate change action﻿. Meet the Artists On-site, one-on-one discussions with artists David Buckley Borden and Aaron M Ellison. I always sign up for fun. It made me happy to create this new Hotel Studio Allston installation. The Land New England installation celebrates Boston landscapes ranging the Boston Harbor Islands to the Emerald Necklace with a spirited interior featuring prints, wallpaper supergraphics, and two dozen speculative-design sculptures ranging from "landy joy sticks" to "climate-change marshalling wands." It was an absolute pleasure to work with Liz, Emily, and Madeline of Isenberg Projects on this installation. Dr. Aaron Ellison and I will be giving a free public talk (art x design x ecology) on November 7th starting at 6:30PM at Le Laboratoire (Cafe ArtScience, 650 East Kendall Street, Cambridge, MA 02142). Find more details about the event here. Register for the event here. The Harvard Forest will host a public event from 10:00 a.m. to 4:00 p.m. on Saturday October 20, 2018, to explore species loss and encourage community action. A panel discussion and Q&A by experts on invasive species and human decision-making will augment guided tours of Hemlock Hospice, a field-based sculpture installation created by Harvard Forest Fellow David Buckley Borden. The new Hemlock Hospice documentary film will also premiere. Doors will open for the Oct. 20 event at 10:00 a.m., and the first guided tour of Hemlock Hospice sculpture exhibition will begin at 10:15 a.m. In a speaker program beginning at 12:00 p.m. in the Fisher Museum, scientists Dave Orwig, Laura Meyerson, and Valerie Pasquarella from Harvard Forest, the University of Rhode Island, and the University of Massachusetts at Amherst, respectively, will discuss the ecosystems we’re losing due to invasive species in New England, the impacts this loss has on our landscape and human well-being, the changes we can expect to see in Central Massachusetts, and the range of actions community members can take. The panel discussion will be followed by the premiere of a new documentary film by Faizal Westcott, Devin Chaganis, Casey Keenan, David Buckley Borden, and Aaron Ellison, about hemlock loss in New England and the Hemlock Hospice exhibition. The film screening will be followed by a second guided tour of the art exhibition from 2:15 p.m. to 4:00 p.m. The Hemlock Hospice exhibit will remain on view at the Harvard Forest through November 18, 2018. More event details available here. NPR’s Living on Earth featured the Hemlock Hospice project today. Many thanks to Savannah Christiansen for taking the time to journey to the Harvard Forest to produce this thoughtful piece with Aaron Ellison and I. Listen to this radio program here. 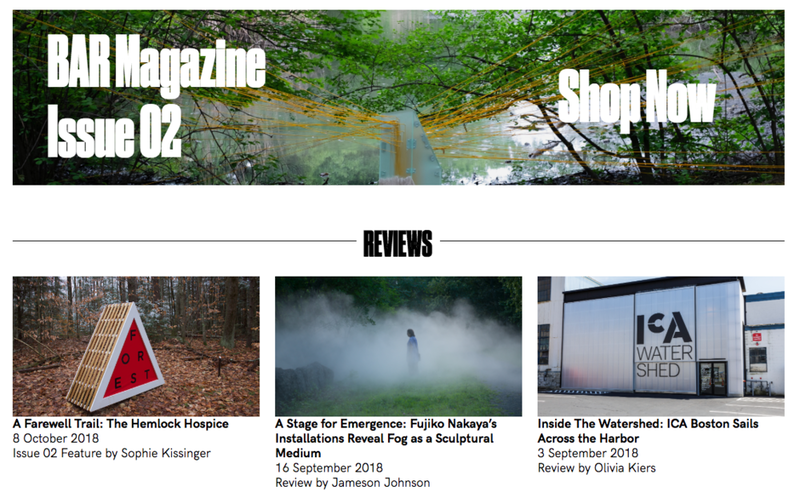 I am delighted to read Sophie Kissinger’s review of the Hemlock Hospice project in the latest issue of the Boston Art Review. You can read the insightful review in print and now online. The BAR also has a sharp online event/happening listing and listserv. Sign up and get involved.